What pops into your mind when you think of Santorini? Is it images of wild volcanic scenery, magical sunsets, dark sandy beaches and pretty whitewashed houses with blue domed roofs? Or endless sunshine, laid-back tavernas, quaffable red wine and fashionable nightlife? 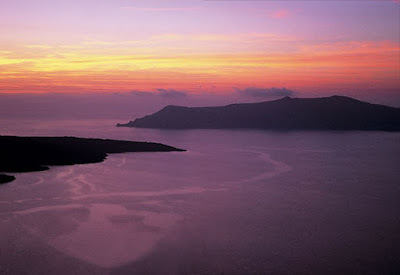 If so, you're not wrong; the southern Cycladic island has all this in spades. But there's a darker underbelly to the Greek paradise that few people are aware of. Forget Transylvania, with its infamous, blood-thirsty Count Dracula. It's Santorini that's thought to be the place in the world most inhabited by vampires. But why Santorini? Greek legend has it that suspected vampire corpses were rowed across to islands for burial, as these spooky ghouls were supposedly unable to cross sea water. Santorini and neighbouring islets Thirassia and Kameni are believed to house many of them, basically acting as mass dumping grounds for the undead. The undeniably beautiful landscape can certainly appear a little sinister on occasion. The volcanic backdrop is eerily desolate and at times, you can catch the slight whiff of sulphur on the wind. It's not surprising that legends of vampires, or vrykolakas as they are known in Greek, caught the imagination of Santorini's past inhabitants. So what do you need to know about vrykolakas? First of all, forget Hollywood stereotypes - Greek vampires are an altogether different prospect. Unlike their Balkan cousins, they are rarely associated with blood sucking and you'll need more than sunshine and garlic-infused meze to protect you from these creatures. According to legend, locals who died violently, lived a sinful life or didn't get a proper burial were taken over by an evil spirit and became vrykolakas. Even a cat jumping over your corpse before you were buried could result in you turning into one of the undead. Death plays an important role in many Greek legends, expressing a deep-rooted belief in the sanctity of life. Legend has it that a vampire would knock on the door of a house, calling out the names of the residents. If they didn't reply straight away, it would pass on, but woe betide those who opened the door. To avoid a sticky end and ghoulish transformation, superstition dictates that you should never open a door until the second knock. Vrykolakas were said to be just as active at midday as at midnight and would kill a victim by sitting on his chest and suffocating him while he slept. In the days when medical knowledge was hazy, a heart attack could therefore be attributed to a vrykolakas. If you're a fan of Buffy, Bram Stoker and Twilight, you may need to readjust your proposed method for killing a vampire - driving a stake through its heart or exposing it to sunlight will not work in Greece. Traditionally, vrykolakas-slaying was a weekend activity, as the creature was restricted to its coffin between Saturday evening and Sunday morning. As with all vampire stories, there were conflicting arguments as to the best way of destroying the body, but the most popular included exorcism by a priest, impaling, beheading and finally burning the body, to free the vrykolakas from its living death and allow local residents to sleep soundly. Today, Santorini locals tend to be nonplussed by vrykolakas and indeed, many only have a hazy recollection of stories passed down from their grandparents. Growing up in a culture rich with (often gruesome) myths and legends, the majority of islanders take tales of vrykolakas with a hefty pinch of salt. Ask around for people's opinions on them and some will say it makes sense that the island's wild, volcanic beauty led to the creation of such legends, as it's easy to imagine vrykolakas feeling at home here. There are local residents, however, who do not wish to discuss the creatures. It appears that for some, this legend is still all too real. Look out for sailors taking boats across to Thirassia or Kameni, the so-called "vampire graveyards". Traditionally crew members will form the sign of the cross with ropes before tying up to the pier. This long-standing superstition is believed to protect boats from vrykolakas looking to destroy craft that sail too close to their islands.